As we embark on a new year, our goals for this year can be easily recognized as we hear about them throughout our lives. Whether that be goals for personal growth, achieving success, replacing bad habits, or improving relationships; goals are there to help us navigate through life. As such, it is critical for our therapists to help our clients, in the same manner, setting realistic and challenging goals during therapy. An important part to expect of goal setting is that they can vary from client to client. A counselor will do their utmost to collaborate with you to create a plan just right for you. Research shows therapy is only useful when it involves having a set plan for what you hope to accomplish and experience. At the onset of treatment, it is essential for the client to have a good understanding of what they can work towards and what to expect. Setting goals will also help our Houston therapists have a good grasp of the growth in their clients, allowing both the therapist and the client to make changes as needed. Let us take a closer look at the incentives of goal setting. How Does Goal Setting with Our Therapists Help You? Regarding your mental and emotional health, goal setting sets up the stage for our therapists to help you improve all aspects of your life. It is a valuable tool that helps the client achieve more in the end. Our clients have noticed improved performance and motivation to put action into attaining their goals. The pride and satisfaction they experience from reaching their goals grow their self-confidence to push further to increase their capacity. 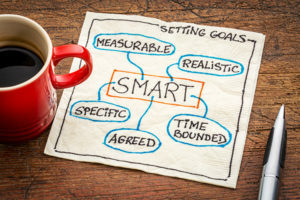 Studies show that people who set useful goals during their counseling sessions suffer less from stress and anxiety overall because they find that they can concentrate better and are happier in general. Our clients can track what they have done and embrace what they can do – it gives them a boost to strive for more difficult and challenging goals. Another benefit to goal setting with our therapists is the accountability aspect of our sessions. Given a solid plan to work towards, and exercises to work on in between sessions have been proven to make significant changes to clients. A counselor can hold the client accountable and responsible for their development with the agreed upon goals. Once a client accomplishes a goal, the therapist and the client can regroup to identify new targets and modify old ones. Clients often have a specific end-goal in mind, which makes the work a lot more fulfilling as our therapists can then help a client turn their dreams into reality. However, along with their goals, our clients often have concerns over the length of their treatment. Therapy sessions can range from short-term treatments of 6-8 sessions to long-term treatments that can last as long as it’s appropriate. Most therapy goals are with short-term treatments. Only complex and prolonged issues will require long-term commitments. Nonetheless, there is no set number of sessions that a client can schedule with our therapists. We can work with you with as many or as little amounts of sessions as you feel suitable to your specific situation. The most prominent takeaway is that short-term or long-term commitments should not discourage you from seeking professional help in the first place. What Are Steps To Set Goals? The interview process will help guide our therapists in making the most effective and fitting plan where they use encouraging and precise statements. The goals will include prioritized deadlines so that our clients do not feel overwhelmed and misdirected. A client will be aided to write down goals and sub-goals that are performance-oriented, not outcome-oriented. Staying in comfort zone: there are many clients who, being unprepared to stretch themselves and grind through the resistance they face in changing, will set low goals that are of any real worth. By taking it easy, a client can cheat themselves of receiving some reliable help to become better. Fear of failure: society has a massive stigma around failure. It is embedded in our minds and enforced by our culture through the media, education, and social interactions. As our clients achieve their goals, their self-confidence will begin to rise as well, leading to having the self-assurance to taking more substantial risks. It is crucial to understand that failure is a positive thing; failures allow our clients to realize where they can make adjustments in their goal to refining their skills. Comparison: comparing your goals to the goals of others is a hazardous game to play. Our therapists have seen clients come and go with minimal improvements because they set their goals upon someone else’s performance. Thus, they set unrealistic goals that are not suitable for their situation. Success means something different to every client that comes through our doors.